FILE - Chinese cargo ships sail on the Mekong River near the Golden Triangle at the border between Laos, Myanmar and Thailand, March 1, 2016. 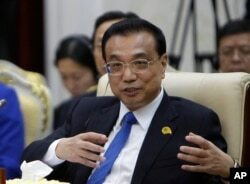 In March 2016, while chairing the first summit on the Beijing-initiated Lancang-Mekong Cooperation (LMC), Chinese Prime Minister Li Keqiang, in a speech, cited an anonymous Southeast Asian proverb: "When gentle breezes stick together, they can have the power of a typhoon." Li addressed leaders of the nations through which the Mekong River flows, setting forth the foreign policy initiatives of the LMC with its objectives to engage and promote cooperation and development among the riverine nations. Lesser known than another Chinese international development effort, the Belt and Road Initiative, Beijing introduced the LMC in 2015, identifying it as "a new type of sub-regional cooperation mechanism" en route to a joint objective of "building a community of shared future among Lancang-Mekong countries." 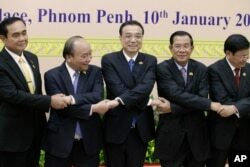 China's Premier Li Keqiang, center, shakes hands with his counterpart, Nguyen Xuan Phuc, second from left, of Vietnam, Prayuth Chan-o-cha, left, prime minister of Thailand, Hun Sen, second from right, of Cambodia, and Thongloun Sisolith, right, of Laos, before an opening of the Lancang-Mekong Cooperation Leaders' Meeting, in Phnom Penh, Cambodia, Jan. 10, 2018. With a second summit of the six Mekong nations — China, Myanmar, Thailand, Laos, Cambodia and Vietnam — taking place January 10 and 11 in Phnom Penh to discuss a five-year development plan for the river, the LMC is rolling along. Central to discussions will be the issue of water management, including the development of dams and irrigation infrastructure, which represent control of the Mekong. Originating in Tibet, the Mekong, known as the Lancang in Chinese, flows for 4,300 kilometers to drain into the South China Sea. Its fish provide livelihoods for an estimated 60 million people, and "as a source of food, touches the lives of more than 300 million from over 100 ethnic groups," according to the World Wildlife Fund. Any measures to regulate the river's flow — such as dams — have the potential to affect the member nation's economies. "The LMC is clearly a bid by China to take control of Mekong matters, after having refused to join the Mekong River Commission," said Milton Osborne, a Southeast Asia expert who wrote the 2000 book The Mekong: Turbulent Past, Uncertain Future. "In doing so it seeks to legitimize its own actions in building dams within its own borders while its state-linked commercial companies are associated with dam building downstream from China," Osborne told VOA Khmer in an email. 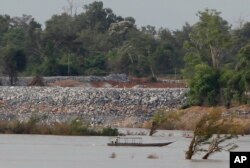 FILE - A fishing boat passes near a construction site of the Don Sahong dam, near the Cambodia-Laos borders, in Preah Romkel village, Stung Treng province, northeast of Phnom Penh, Cambodia, June 20, 2016. The LMC represents a sign of the limitations the Mekong River Commission faced in stopping dam projects that could potentially be harmful to the Mekong region, he said. Cambodia, the Lao PDR, Thailand and Vietnam make up the commission. When it was formed in 1995, China and Myanmar opted out, which meant they could skirt the rule requiring commission members to present dam proposals for discussion. "I am not optimistic that [the LMC] will play a positive part in addressing the major issues that now confront the environmental challenges aligned to the Mekong: decline in fish stocks, the issues associated with climate change, the particular problems of the Mekong Delta," Osborne said. Elliot Brennan, an independent researcher on Southeast Asia affairs, told the South China Morning Post that "the Mekong issue had the potential to be the largest China-ASEAN conflict flashpoint after the South China Sea, and that Beijing regarded controlling the river as a strategic objective. If Beijing manages to achieve control of the Mekong's development it would quickly become a crucial artery for China's rise and exportation of influence into ASEAN." A Chinese embassy spokesman in Phnom Penh could not be reached for comment Monday. China has said the LMC initiative is moving forward and making "remarkable progress" since it took place a few years ago, vowing to implement the initiative with "neighborhood diplomacy policy" through the ideas of "amity, sincerity, mutual benefit, and inclusiveness." In the past few weeks, China and member countries Cambodia and Laos moved to forge deals on new funding projects. All six member nations — the Mekong nations — had created secretariats to take charge of LMC matters by the end of December 2016. Policy research organizations, many of them aligned with the six riverine governments, joined to form the Global Center for Mekong Studies last year to advise LMC member countries on a range of topics from politics to business. "The [LMC] has grown into a sub-regional cooperation framework with great potential and vitality," Li said in an op-ed published this week in the Phnom Penh newspaper, Khmer Times. "In the context of rising backlash against globalization and protectionist sentiments as well as lack of momentum in East Asian cooperation, the LMC as a basic component of regional cooperation is not only conducive to narrowing the development gap within ASEAN and advancing ASEAN integration, but also enriches South-South cooperation and efforts to foster a more open, inclusive, and balanced economic globalization that benefits all," Li wrote. The hosting Cambodian Foreign Ministry announced that the summit, with the theme of "Our River of Peace and Sustainable Development," would discuss ways to fix the development gaps among the downstream nations in support of ASEAN integration and the United Nations' Sustainable Development Goals, and ways to bolster people exchanges. Po Sovinda, international relations analyst with the East China Normal University in Shanghai, said China, as an upstream country of the Mekong River, likely would use the LMC as a model of Beijing-led multilateral institutionalizations by proving that it would "not seek hegemony." This would also build trust for its larger Belt and Road Initiative (BRI) plan, he said. Po Sovinda added that China could face a backlash, however, if it mismanages the river by pursuing unilateral decisions, which run contrary to its "'peaceful development' rhetoric." By excluding China and Vietnam, the other LMC member states are not the claimants in the South China Sea conflict that in the past decade has had impacts on China's soft power engagement, analysts say. Brian Eyler, director of the Southeast Asia program at the Stimson Center in Washington, said Beijing could offset its "lack of multilateral engagement" in the South China Sea through its initiation of the LMC, adding that the Mekong engagement also could "shift attention away" from the conflicted sea. "With the exception of the LMC being a multilateral initiative, China's approach is a continuation of its economic expansion and market dominance in mainland Southeast Asia," Eyler said. "The LMC will [also] serve as a jumping off point for excess capacity in China's industries such as hydropower, coal, highways, rail, and port development and seek to add a layer of political legitimacy to the offloading of this excess capacity through the Belt and Road Initiative," he added. A similar multilateral mechanism, the MRC, which is backed by the West, has been criticized for being unable to stop a number of controversial hydropower dams along the Mekong River. Up to 31 hydropower dams are expected to be built on the Mekong mainstream by 2030, according to the Consultative Group for International Agricultural Research. FILE - A hydropower dam is seen on the Mekong River in Xayaburi Province, Laos, in this undated photo. That the upstream dams are in China has allowed "water diplomacy" to emerge. In 2016, when downstream countries faced their worst drought in years, environmentalists said the intensity of the drought was caused, in part, by the dams. Vietnam asked China to release water and when China agreed, called the move a "gesture of goodwill." China is playing a key role in many downstream LMC countries. The largest foreign financier and investor in Laos, China has voiced support for Myanmar in its internationally-condemned treatment of Rohingya. In Cambodia, China is supporting Prime Minister Hun Sen's crackdown on dissent and Cambodia is supporting China on many regional and international agendas. Within the LMC structure, China is funding all proposed projects expected to be adopted this week, Cambodian government spokesman Phay Siphan said, adding that each member state is given equal decision-making power through a consensus format. "This [cooperation] works toward security, sustainable development, and well-being of our people as the most important trios," Phay Siphan said. "For Cambodia's part, we seek investment on connectivity, irrigation infrastructure, and projects toward lower energy costs that could attract more investments and create more jobs."